Animals typically live in close association with commensal and symbiotic microbes forming a single metabolic unit – the Holobiont. Recent studies have revealed that the status of gut microbiota can influence nutrition-related syndromes such as obesity and type-2 diabetes, and ageing. However, to-date we know very little about how such interactions are regulated. We focus on understanding how these microbial communities determine human physiology, and if they can be targeted by drugs to improve human health and ageing. 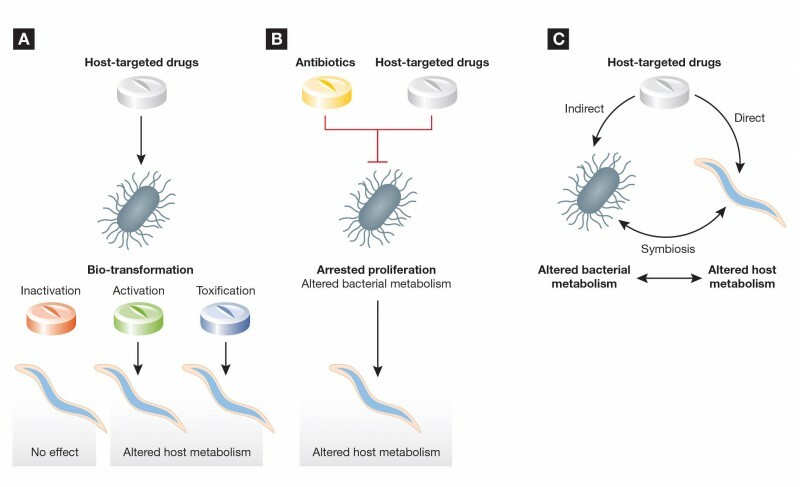 We developed a complementary pharmacological pipeline with the potential to unravel drug-diet-microbe-host interactions. For this purpose, we utilise two tractable genetic models: the bacterium E. coli and the nematode C. elegans, widely used for host-microbiome research. We combine classical and advanced microbial genetics and high-throughput genomic/chemical approaches with targeted metabolomics at the holobiont level. This strategy will identify drugable mechanisms in bacteria (e.g. signalling/biochemical pathways) that alter microbial metabolite availability with the capacity to regulate host physiology. Testing host-targeted drugs in C. elegans. A- Biotransformation; B- Impairment of bacterial metabolism; C- Dual drug host-microbe metabolic impact. 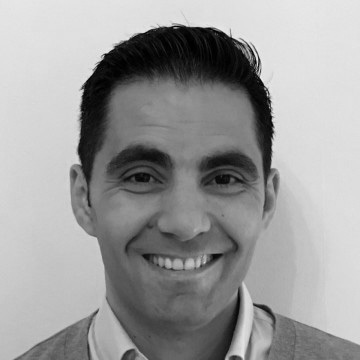 Filipe Cabreiro holds a Sir Henry Dale Fellowship. Norvaisas P and Cabreiro F. (2018). Pharmacology in the age of the holobiont. Current Opinion in Systems Biology, 10, 34-42. Scott TA, Quintaneiro LM, Cabreiro F. (2017). Microbiome genetics underpins chemotherapy. Oncotarget, 8(55), 93393-93304. Scott TA, Quintaneiro LM, Norvaisas P, Lui PP, Wilson MP, Leung KY, Herrera-Dominguez L, Sudiwala S, Pessia A, Clayton PT, Bryson K, Velagapudi V, Mills PB, Typas A, Greene NDE, Cabreiro F. (2017). Host-Microbe Co-metabolism Dictates Cancer Drug Efficacy in C. elegans. Cell 169, 442-456 e418. de la Guardia Y, Gilliat AF, Hellberg J, Rennert P, Cabreiro F, Gems D. (2016). Run-on of germline apoptosis promotes gonad senescence in C.elegans. Oncotarget, 7(26), 39082-39096. Cabreiro F. (2015). Metformin joins forces with microbes. Cell Host and Microbe, 19(1), 1-3. Pryor R, Cabreiro F. (2015). Repurposing metformin: an old drug with new tricks in its binding pockets. Biochemical Journal, 471(3), 307-322. Cabreiro F, Au C, Leung KY, Vergara-Irigaray N, Cochemé HM, Noori T, Weinkove D, Schuster E, Greene ND, Gems D. (2013). Metformin retards aging in C. elegans by altering microbial folate and methionine metabolism. Cell 153, 228-239. Cabreiro F, Gems D. (2013). Worms need microbes too: microbiota, health and aging in Caenorhabditis elegans. EMBO Mol Med 5, 1300-1310. Coburn C, Allman E, Mahanti P, Benedetto A, Cabreiro F, Pincus Z, Matthijssens F, Araiz C, Mandel A, Vlachos M, Edwards SA, Fischer G, Davidson A, Pryor RE, Stevens A, Slack FJ, Tavernarakis N, Braeckman BP, Schroeder FC, Nehrke K, Gems D. (2013). Anthranilate fluorescence marks a calcium-propagated necrotic wave that promotes organismal death in C. elegans. PLoS Biol 11, e1001613. Burnett C*, Valentini S*, Cabreiro F*, Goss M, Somogyvári M, Piper MD, Hoddinott M, Sutphin GL, Leko V, McElwee JJ, Vazquez-Manrique RP, Orfila AM, Ackerman D, Au C, Vinti G, Riesen M, Howard K, Neri C, Bedalov A, Kaeberlein M, Soti C, Partridge L, Gems D. (2011). Absence of effects of Sir2 overexpression on lifespan in C. elegans and Drosophila. Nature 477, 482-485.